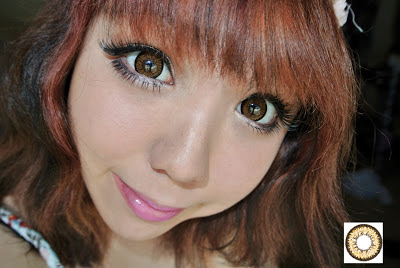 The lovely Loveshoppingholics, sent me one of my favorite line of lenses to review!♥♥. You can check out my review on the grey ones here. The design is sooo pretty. I love the effect it gives of a "ring" in the desgin. Loooooove the dark ring on these lenses so much for the dolly effect. These would be a perfect 5/5 if they were more comfortable. But I love them so much, I wear them still. Try them out!!! I hope you all liked this review. If you want to buy these lenses, they're only about $20 from loveshoppingholics. We also have a discount that you can use for $2 off a pair (look at our sidebar for code). Thank you again loveshoppingholics for these super kawaii lenses. Also please join our giveaway that ends May 31st. Oh really pretty tha lens looks pretty natural on you!